We have attained a strong foothold over the market in a span of 12 years by offering quality range of Industrial Seal, Single Spring Seal, Balance And Unbalance Spring Seal, External Mounted Seal, PTFE Bellow External Mounted Seal, Catridge Balance Seal, Multiple Spring Balance Seal, Dry Running Reverse Balance Seal, Agitator Double Acting Unbalance Seal, Single Conical Helical Spring, Rubber Bellow Seal, Multi Spring Seal, Metal Bellow Seal, Elastomer Bellow Seal, Conical Spring Seal, Agitator Seal, Air Condition Compressor Seal, Auto Cooling Seal, Metallic Bellow Seal, Seal Spares, Horizontal Centrifugal Pump, PTFE Bellow Seal, Single Coil Spring Seal and many more. 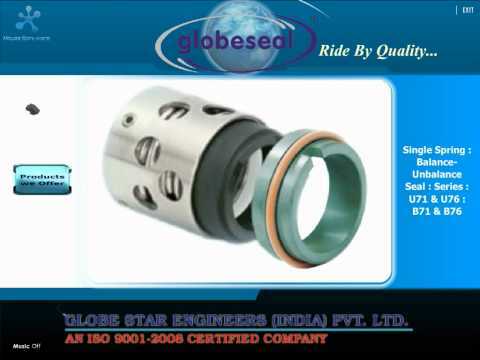 Welcome to Globe Star Engineers India Private Limited, Manufacturer and Exporter of Industrial Mechanical Seals, Pump Spares and Pumps. We are an ISO 9001 2008 certified company, incepted in 2000 at Ahmedabad. We Cater to Chemical, Textile and other industries. Stringent quality products and Prompt order processing help us to serve Clientele like Reliance Industries Limited and Meghmani Group. Single, Multi and Multiple Spring Unbalance Seals are some of our products and services. External Mounted Reverse, PTFE Bellow External Mounted and Agitator Double Acting Unbalance Seals are a class apart. We also provide API Plans, Double Mechanical Seals and Thermosyphon Systems that are well known for their durability. Our Seal Spares, Repairing Services and Specialized Engineering Components are extremely reliable. Along with that we offer Rotary Joints, Split Seals and Carbon Products that are cost effective. Our organization is specialized in manufacturing a qualitative range of Horizontal Centrifugal Pumps, Mechanical and Chemical Seals.